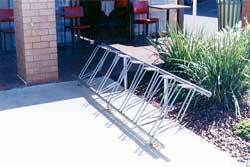 The Carousel Bike Rack is a practical, and yet eye-catching alternative to the traditional style bike rack. 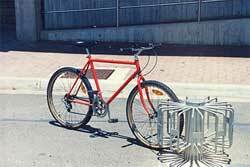 Designed to use a minimum of space, this unit will readily accept ten bikes, and is manufactured from Hot dip galvanized steel. Available in bolt down or concrete in models. A similarly constructed and finished to the wall mounted bike rack, the Ramp Rack is suitable to be used as a free standing item.